Butler Park was worried about the truth being revealed; he hurried to the company but it was too late. Hae Joo and Guem Hee walked out of the toilet and were surprised to see Butler Park. After Guem Hee walked away, he spoke to Hae Joo and demanded to know about their conversations. Butler Park gave Hae Joo a tight slap and forbid her from seeing Chang Hee. Hae Joo cheered herself up and continued to work in the Shipping plant. Butler Park drove Guem Hee to Hae Joo house to look for her mother to verify the truth. At home, In Hwa was annoyed when she found out that her parents had arranged marriage between her and Chang Hee. On the other hand, Kang San met Hae Joo and offered to mentor and work with her. In Hwa was persistent on Kang San and he had no interest in her. She even declared that she followed Kang San to America in front of Hae Joo. Geum Hee looked for Hae Joo mother and asked about the baby clothes to which Hae Joo mother pretended that she does not know. Despite Guem Hee persistence and cries to know about the truth Hae Joo mother refuse to divulge the truth and chased her away. Butler Park heave a sigh of relieves and brought Guem Hee back. Il Moon questioned Chang Hee motive for the arrange marriage with his sister and verbally assaulted him. Chang Hee kept his cool and retorted that he should be wary of his actions because of the rumour surrounding him. Before they can continue, Bulter Park drove Guem Hee home and it was obvious that Guem Hee was badly affected by the incident. President Jang search for Hae Joo resume and presented it to Guem Hee and raise up the matter about her blood type. He insisted that Hae Joo is not her baby and instead she should focus on their children. Guem Hee revealed that II Moon had never look upon her as his mother and he knows the truth about his biological mother. President Jang was unhappy about this matter and reproached II Moon, forcing him to acknowledge Guem Hee as his mother. On the other hand, Bulter Park spoke to Chang Hee and insisted that he break up with Hae Joo. Chang Hee replied that he will use proper ways to defeat President Jang and II Moon. Butler Jang was not convinced and insisted that his son leave Hae Joo but the latter refused. Hae Joo spoke to her mother on the phone and she asked about Guem Hee. Her mother was quick to denied meeting Guem Hee and changed the topic. Chang Hee looked for Hae Joo and showed concern about that incident. He insisted that they will keep on seeing each other despite his father objection. Hae Joo agreed and proclaimed her love for him. Touched by her action, he hugged Hae Joo tightly. Hae Joo family moved to Jeong Woo house stay as the tenants. The next day, Hae Joo went to work and Kang San bring her to his house to learn about ship designing. In Hwa learnt about Kang Woo house through his grandfather. Kang San was shocked to see In Hwa at the doorstep and asked Hae Joo not to open the door. In Hwa demanded to know what Hae Joo is doing in Kang San house, she asked to talk to Hae Joo privately. In a bid to assure In Hwa that she did not harbor any thoughts of dating Kang San, she revealed that she has someone she liked. Butler Park looked through Chang Hee's mobile and was surprised that know that Chang Hee had been keeping contact with Hae Joo using the name of Chief Prosecutor. He reacted in anger when Chang Hee stood steadfast in his love for Hae Joo. II Moon responded to Guem Hee coldly as she approach him. Guem Hee swallowed her sadness and cried at the cliff. After work, Hae Joo went back home together with Bong Hee and they held a mini party celebrate. Hilariously, they danced and sing to Psy – Gangnam Style. It was late at night, Hae Joo was busy washing the dishes as her mother looked at her and reminisce the past and remembered about the incident regarding Guem Hee. Hae Joo and her mother and daughter hugged together and cried. Bong Hee stayed at Jeong Woo house after a few drinks and collapsed on his bed. In an attempt to be closer to Jeong Woo, she placed herself beside him. But he kept moving away from her until he was irritated and left the bedroom to her disappointment. Jeong Woo met Hae Joo outside and they talked for a while before Jeong Woo requested that he become her uncle. Hae Joo was surprised but accepted him as her uncle. Butler Park looked for Hae Joo at Jeong Woo house and begged her to leave Chang Hee for his bright future. Having no choice, she agreed to his request. Kang San met with President Jang to talk about business. He requested Kang San to bend the rules a little for his production line but the latter refused. In the end, he tossed out that he bended the rule when he employed Hae Joo who was eliminated during the interview. Kang San met Hae Joo at the lift lobby and stopped her as she weep. “Hae Joo” a voice was heard and it was Chang Hee. He held on to Hae Joo hand while Kang San stopped him. I think this drama is draggy in terms of storyline as far as we can see; there is not much progression from the last few episodes. I started to worry about the drama if things does not pick up from where they left - it will become very boring. Especially all the heavy drama about the forbidden love and the secret of Hae Joo parentage keeps going back and forth. The only lighthearted moment is about Bong Hee one-sided love and Kang San funny expressions. Not to forget Hae Joo and Family dance to the Gangnam Style. I am surprised that the Koreans really know how to bank in on their super star. Anyway, not all is lost in term of the storyline as we get to peek about Hae Joo mother guilt towards Hae Joo. I really felt touched by the relationship that they shared. 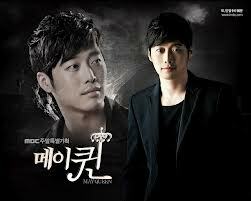 Kim Jae Won played the character of Kang San pretty well and i was impressed with that.